Like most mountains in the world, Seongsan Ilchulbong Peak took shape from volcanic activities several thousand to million years in the past. Unlike many mountains in the world, however, Seongsan Ilchulbong Peak has maintained a spectacular formation that looks as though a volcano has just erupted. This interesting peak rose from under the sea and bolted to the surface from a volcanic eruption that took place more than 100,000 years ago. On top of Seongsan Ilchulbong is a huge crater that is 600 meters in diameter and 90 meters high, and is surrounded by 99 sharp rocks rising vertically up from the shore, making it look like a giant crown. The peak’s southeastern and northern sides are cliffs, while the northwestern side is a picturesque lush grassy hill that connects to Seongsan Village. Tourists love to come here to hike, stroll and ride on horses. The peak is also surrounded by bright yellow flowers that create a truly lovely field in spring. Seongsan Ilchulbong is popularly called “Sunrise Peak” because the view of sunrise from the crater is to die for. In fact, climbing to the top just to see the sunrise is one of the leading activities in Jeju-do. The mountain is found on the island’s easternmost tip, which means it is the first to bathe under the morning sun. However, hundreds of climbers often get frustrated because the thick fog on top usually blocks the view. The climb up normally takes 25 minutes, but visitors are not allowed to enter during bad weather. The mountain is 180 meters high. 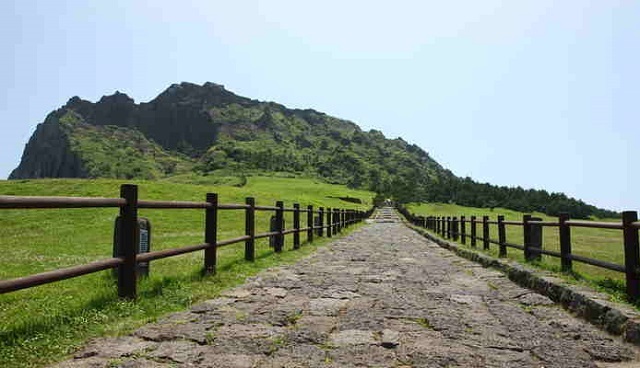 Seongsan Ilchulbong is one of the three UNESCO World Natural Heritage Sites found in Jeju-do. The other two are Mount Halla and Manjanngul Lava-tube. The island of Jeju or Jeju-do is the pride of South Korea. It is the country’s largest and most tourist-friendly island. Located in the Korean Strait, Jeju-do is considered by several travel books as one of the top 10 tourist attractions in the world for its volcanic landscapes, sub-tropical climate, exotic local dishes, sandy beaches, majestic waterfalls and rich cultural festivals. It is also known as the windiest South Korean province. It is known as “Island of the Gods” and Korea’s “Little Hawaii”. Located near the eastern town of Songsan-ri, Seongsan Ilchubong Peak is open to the public from early in the morning (about an hour before sunrise) to 8:00 p.m. in winter and 9:00 p.m. in summer. Admission fee is 2,000 won for adults and 1,000 won for teenagers and children. Parking fee is from 1,000-2,000 won. To get to the mountain, travelers may take a bus from Jeju City that goes directly to Seongsan. The bus ride is two hours long.